Also write down all usernames and passwords to all levels. Start as soon as possible, or you'll regret it later. Last edited by junimond_ on 05-01-2006 13:35, edited 1 time in total. Go to Start > Settings > Control Panel > Sounds and Audio Devices > click the AUDIO tab. Make sure "recording devices" is set to your sound card not a mic. Yes, this riddle is solvable with other OS's. It just takes a bit more time and googling. Several riddlers already solved notpron this way. 18. Does it matter which browser I use? In the past we have recommended using Internet Explorer, mainly because the sound in notpron used <bgsound> which only works in IE. In early 2016 we have switched to <audio> instead which should work in all modern browsers. In theory, you can use any (modern) browser you like. 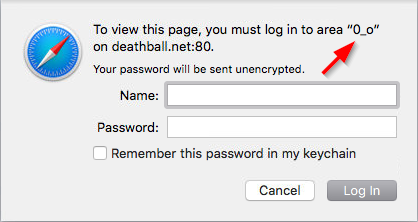 However we do not recommend using Google Chrome, Opera or Safari because they do not show "password hints", (the custom text in the authentication dialog of username/password levels). They do work in Safari, Firefox, Internet Explorer 11 and Edge and can be important or helpful. Chromium stopped showing this text because of safety reasons, and all Chromium based browsers, including Chrome, Opera and Vivaldi, adapted this behaviour. Safari followed. Also, if something doesn't work and you think it should (and it might be browser related), try a recent version of Firefox. If you then find that something does not work, please let us know: send a PM to Jay2k1 or report it in the IRC channel. Last edited by Jay2k1 on 18-07-2017 10:14, edited 4 times in total. 19. How do I get a certificate? Solve notpron without cheating. First the positive levels, then the negative levels, finally the greek levels. At their end, you will be told how to claim your certificate.